- NWA/WWF World Title Unification (November 7, '80) = Kevin von Erich pinned Bill Howard. - WCCW Wrestling Star Wars (March 15, '82) = Kevin & Kerry von Erich fought to a Double Disqualification in a "Texas Death Steel Cage" Match against King Kong Bundy & Gary Hart. - WCCW Fritz von Erich Retirement Show (June 4, '82) = Kevin & David von Erich lost the All-Asian Tag-Team Titles to Magic Dragon & the Great Kabuki. - WCCW Wrestling Star Wars (August 15, '82) = Kevin & David von Erich won the All-Asian Tag-Team Titles, taking down Magic Dragon & the Great Kabuki. - WCCW Christmas Star Wars '82 (December 25) = Kevin von Erich retained the NWA American Heavyweight Title, winning, via DQ, over King Kong Bundy. - WCCW Wrestling Star Wars (June 17, '83) = Kevin lost, via DQ, to the NWA World Heavyweight Champion, Harley Race. - WCCW Independence Day Star Wars '83 (July 4) = Kevin, David, & Kerry von Erich won a "Three Falls" Match over the Freebirds. - WCCW Labor Day Star Wars '83 (September 5) = Kevin won, via DQ, over the NWA American Heavyweight Champion, Jimmy Garvin. Later on, Kevin, David, & Kerry von Erich lost to the NWA World Six-Man Tag-Team Champions, the Freebirds. - CMLL 50th Anniversary Show (September 23, '83) = Kevin von Erich, Mascara Ano 2000, & Halcon Ortiz beat Coloso Colosetti, Pirata Morgan, & Herodes. - WCCW Thanksgiving Star Wars '83 (November 24) = Kevin pinned Terry Gordy. - WCCW Christmas Star Wars '83 (December 25) = Kevin & Mike von Erich won a "No Disqualification Loser Leaves Town" Match over Terry Gordy & Buddy Roberts. 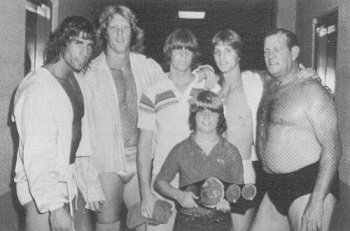 - WCCW 1st Von Erich Memorial Parade of Champions (May 6, '84) = Kevin, Fritz, & Mike von Erich won the NWA World Six-Man Tag-Team Titles, beating the Freebirds (Gordy, Hayes, & Roberts). - NWA Texas Heavyweight Title Tournament (June 23, '84) = Kevin beat Killer Khan, then fell to Ric Flair. Gino Hernandez won the tournament. - WCCW Independence Day Star Wars '84 (July 4) = Kevin, Kerry, & Mike von Erich fell to the Freebirds, who won the Six-Man Tag-Team Titles. - WCCW Labor Day Star Wars '84 (September 3) = Kevin & Kerry von Erich won the NWA World Six-Man Tag-Team Titles, winning a "Handicap Steel Cage Loser Leaves Town Elimination" Match over the Freebirds. - WCCW 1st Cotton Bowl Extravaganza (October 27, '84) = Kevin pinned Chris Adams. - WCCW Thanksgiving Star Wars '84 (November 22) = Kevin lost a "No Disqualification" Match to Chris Adams. - WCCW Christmas Star Wars '84 (December 25) = Kevin won a "Lumberjack" Match over Chris Adams. - WCCW Wrestling Star Wars (January 28, '85) = Kevin defeated Rip Oliver. Later on, Kevin, Kerry, & Mike von Erich beat Chris Adams, Gino Hernandez, & Jake Roberts. - WCCW 2nd Von Erich Memorial Parade of Champions (May 5, '85) = Kevin, Kerry, & Mike von Erich & the Freebirds won a "Two Ring Five Falls" Match over Chris Adams, Gino Hernandez, Rip Oliver, Steve Williams, Kamala, & the One Man Gang. Later on, Kevin fought to a Double Countout with the NWA World Heavyweight Champion, Ric Flair. - WCCW Independence Day Star Wars '85 (July 4) = Kevin & Kerry von Erich were beaten by Chris Adams & Gino Hernandez. - WCCW Labor Day Star Wars '85 (September 2) = Kevin pinned Chris Adams. Later on, Kevin & Kerry von Erich & Brian Adias won the NWA World Six-Man Tag-Team Titles, beating Mark Lewin, Jack Victory, & the One Man Gang. - WCCW 2nd Cotton Bowl Extravaganza (October 6, '85) = Kevin & Kerry von Erich won a "No Disqualification Hair vs. Hair" Match over Chris Adams & Gino Hernandez. - WCCW Thanksgiving Star Wars '85 (November 28) = Kevin & Kerry von Erich lost a "Steel Cage" Match to Chris Adams & Gino Hernandez, who won the vacated American Tag-Team Titles. Brian Adias and Terry Gordy were the special referees. - WCCW Christmas Star Wars '85 (December 25) = Kevin & Kerry von Erich won, via DQ, over the American Tag-Team Champions, Chris Adams & Gino Hernandez. Later on, Kevin, Kerry, & Lance von Erich defeated the Freebirds. - NJPW Sumo Hall (February 6, '86) = Kevin von Erich won, via DQ, over Kengo Kimura. - WCCW Independence Day Star Wars '86 (July 4) = Kevin, Lance, & Mike von Erich retained the WCCW World Six-Man Tag-Team Titles, winning over Matt Borne, Butch Reed, & Buzz Sawyer. 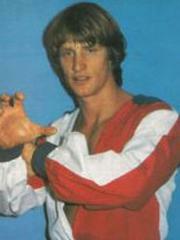 - WCCW Labor Day Star Wars '86 (September 1) = Kevin & Mike von Erich lost, via countout, to Matt Borne & Buzz Sawyer. - WCCW 3rd Cotton Bowl Extravaganza (October 12, '86) = Kevin won the WCCW World Heavyweight Title, pinning Black Bart. - WCCW Thanksgiving Star Wars '86 (November 27) = Kevin stayed the WCCW World Heavyweight Champion, beating Black Bart. Later on, Kevin won a "Lights Out" Match over Al Madril. - WCCW World Tag-Team Titles Tournament (September 1, '86) = Kevin & Mike von Erich lost in the first round to the eventual winners, Matt Borne & Buzz Sawyer. - WCCW Christmas Star Wars '86 (December 25) = Kevin & Mike von Erich won, via DQ, over the WCCW World Tag-Team Champions, Brian Adias & Al Madril. - WCCW Wrestling Star Wars (February 2, '87) = Kevin retained the WCCW World Heavyweight Title, taking down Al Madril. 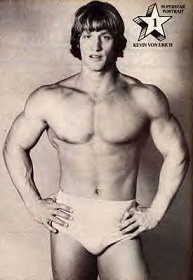 - WCCW 4th Von Erich Memorial Parade of Champions (May 3, '87) = Kevin stayed the WCCW World Heavyweight Champion, fighting to a Double Countout with Nord the Barbarian. - NJPW Sumo Hall (June 12, '87) = Kevin von Erich & Tony St. Clair fell to Masa Chono & Kengo Kimura. - WCCW Labor Day Star Wars '87 (September 7) = Kevin lost, via Countout, to the WCCW World Heavyweight Champion, Al Perez. - WCCW 4th Cotton Bowl Extravaganza (October 17, '87) = Kevin defeated Al Perez in a match for Perez' WCCW World Heavyweight Title. However, due to outside intereference, the belt was returned to Perez. - WCCW Thanksgiving Star Wars '87 (November 26) = Kevin won a "Texas Death" Match over Al Perez. - NJPW Sumo Hall (December 4, '87) = Kevin & Kerry von Erich took down Shiro Koshinaka & Keiji Mutoh. - WCCW Christmas Star Wars '87 (December 25) = Kevin von Erich, Chris Adams, & Steve Simpson won the vacated WCCW World Six-Man Tag-Team Titles, winning over Terry Gordy, Iceman Parsons, & Buddy Roberts. - WCCW 5th Von Erich Memorial Parade of Champions (May 8, '88) = Kevin von Erich & Bruiser Brody won over Solomon Grundy & Buddy Roberts. - WCCW 5th Cotton Bowl Extravaganza (October 15, '88) = Kevin won, via DQ, over Brian Adias. - WWC 16th Anniversary Show (October 7, '89) = Kevin defeated Ron Bass. - Tri-State Wrestling Autumn Armageddon (September 15, '90) = Kevin von Erich & Chris Adams fought to a Double Countout with Austin Idol & Al Perez. - WWE Wrestlemania XXV (April 5, '09) = Kevin was inducted into the WWE Hall of Fame.